Home » Is the Market Plunge Boosting Gold? This week, Your News to Know rounds up the most important news stories about the economy and the gold market. Stories include: Gold rising as dollar and markets fall, gold is starting to recover amid global market fear and a Nazi gold train purportedly found in Poland. Gold seems to be heading back up, thanks to a falling dollar and market difficulties. On Monday morning, the London Bullion Market (LBMA) gold price was set at $1,153 while the dollar Index weakened, going from 96.50 to 94.94. The greenback sunk against every major currency other than the yuan, which was intentionally devalued by China. This helped the yellow metal rise against the dollar ahead of New York’s Monday opening, leading to large Exchange Traded Fund (ETF) gold purchases by the Standard & Poor’s Depository Receipts (SPDR) and the Gold Trust (5.96 and 0.6 tons, respectively). In the U.S., the Dow plunged further past support numbers while equity markets in China went down 10% amid heavy selling. Over at lawrieongold.com, Julian D.W. Phillips forecasts heavy volatility in the global financial markets throughout this week. Thanks to negative financial news from around the globe, gold managed to break above its 50-day moving average. Forbes contributor Frank Holmes notes that the ‘Fear Trade’ seems to be in full effect as gold regains some of its safe-haven appeal; he also explains why investors are once again warming up to the metal. For starters, China’s economy continues slowing down in the wake of the country’s devaluation of the renminbi – their preliminary purchasing managers’ index reading from Friday was at a 77-month low. Likewise, the U.S. stock market is tumbling and undergoing an “ugly selloff”, as Holmes puts it. As the Dow Jones Industrial Average nears correction territory, U.S. stocks are lining up for their worst month since May of 2012. It’s also worth mentioning that crude oil dipped under $40 per barrel, continuing the longest losing streak in 29 years, one that ravaged Russia’s economy. Holmes finds that the Russian ruble, which lost nearly 50 percent of its purchasing power in the last 12 months, serves well to outline value of hard assets against fiat currencies. While hedge funds assume short positions, contrarian investors are seizing the opportunity to increase their exposure to gold, as evidenced by a 124 percent month-over-month increase in American Eagle gold coin sales in July. Even Germany, a country with a remarkably strong economy, experienced a 50 percent increase in gold demand during the first half (H1) of 2015 over the same period last year. Was a long-lost Nazi gold train carrying massive amounts of bullion recently uncovered in Poland? The authorities in the area certainly seem to think so, as they are taking the reports very seriously. Using a law firm as a medium, two men recently reached out to a district council in the southwest of Poland with claims of knowing the train’s location. 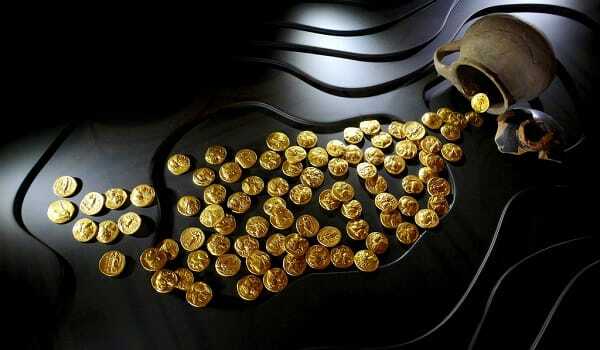 There is no official confirmation yet, however, as the two are demanding 10 percent of the treasure’s worth once it is handed over. Historical accounts support the veracity of the men’s claims, as numerous Nazi trains carrying stolen goods are thought to have been left behind when Soviet troops advanced in 1945. Aside from 300 tons of gold, the 150-meter long train also purportedly carries dangerous objects, leading to the police, the fire brigade and even the army all getting involved with the case. Marika Toparska, an authority inside the Walbrzych Council who confirmed the reports, also told CNBC via email: “We know that is a military train with guns on it. We can suppose that inside could be also other weapons or even dangerous materials. Even methane gas (could be) inside of the tunnels.” Local media believes the train is located somewhere near Ksiaz castle, southeast of the Polish town of Wroclaw.